My world for a lentil. Hello, Lentils? Hi. It’s me. Peggy. …Say what? I’ve fallen from your favor? Sorry I’ve been snubbing you for the past couple of months. But I’m needing—nay, craving—to have you back into my life. I’m done with wretched excess; the frothy creams, sumptuous sauces and trumped-up cocktails that caught my eye in December. I miss your tasteful earthiness, your smart frugality, your downright wholesomeness. Give me one more chance–I’m begging!–to make things right. 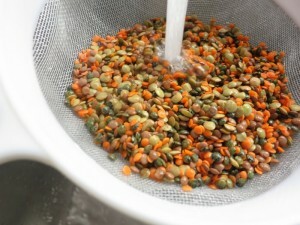 Always wash lentils and remove small stones before cooking. Mid-January finds me as another bloated statistic entrenched in detox, mainlining soups loaded with beans and veggies, forcing myself to pound out another mile (er…block) on the treadmill while my headphones knock out a lobotomizing Latin Dance Club collection, which insists my legs move forward. And lentils are back into my life. What’s not to love about these petite colorful beans? User friendly, they cook fast and don’t need soaking; they’re a powerhouse of nutrition and easy on the purse strings. 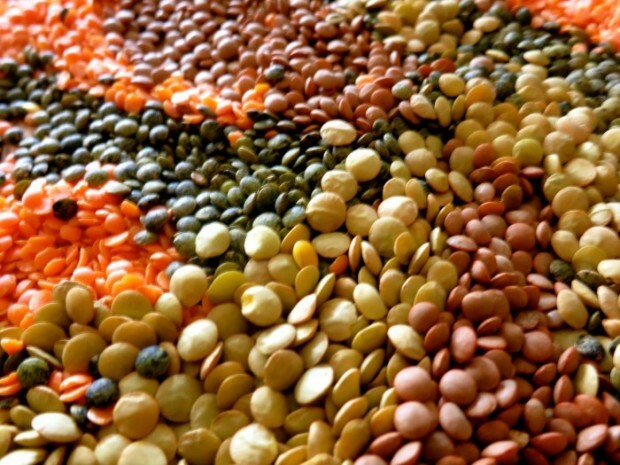 Below, I’ve assembled a slide show of lentil inspiration. One recipe not featured is a no-recipe-recipe I recently made: Quinoa-Lentil Salad: In separate pots, cook equal parts of black beluga lentils and quinoa until tender, then drain and toss in a vinaigrette made with a smidgen of garlic, lemon juice and extra virgin olive oil. Toss with feta cheese and you’ll be doin’ right by lentils. More Recipes Filed Under "Peggy's Healthy Picks"